Holed up in Franklin, NC, Dale “Grey Beard” Sanders is putting the finishing touches on his pack list. 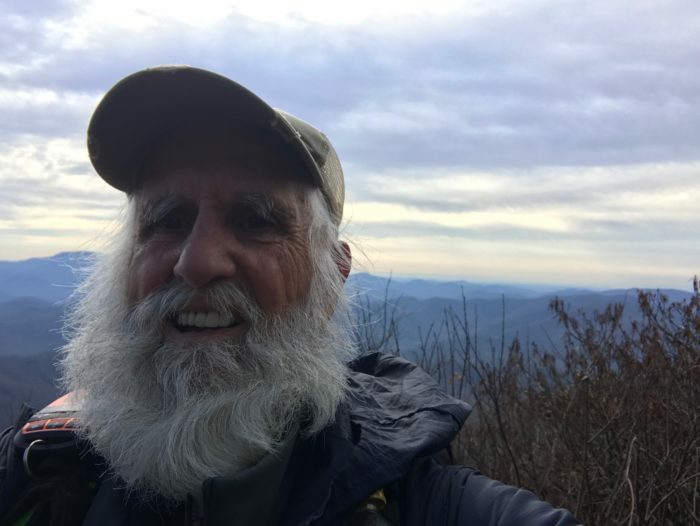 At 81 years old, Grey Beard is over 100 miles into his thru-hike attempt on the AT. 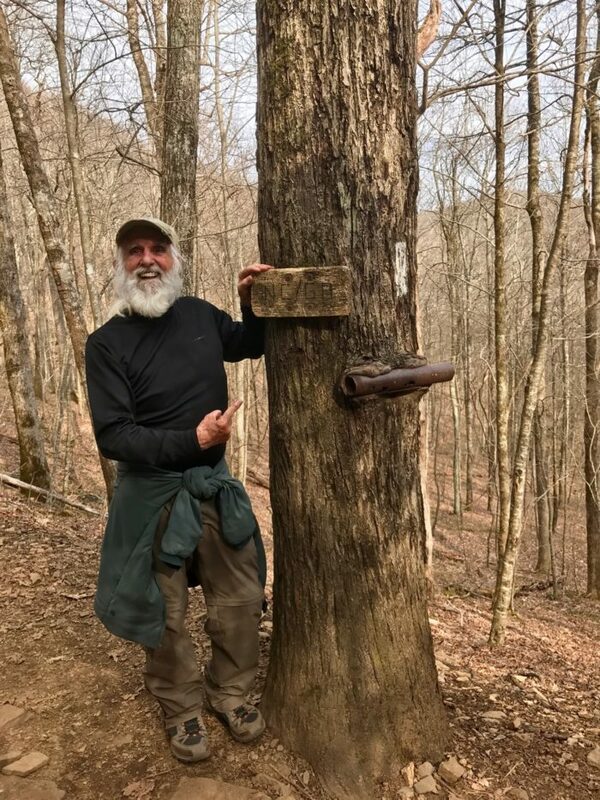 If he finishes the trail within one year from his start date, he will hold the record for the oldest AT thru-hiker. 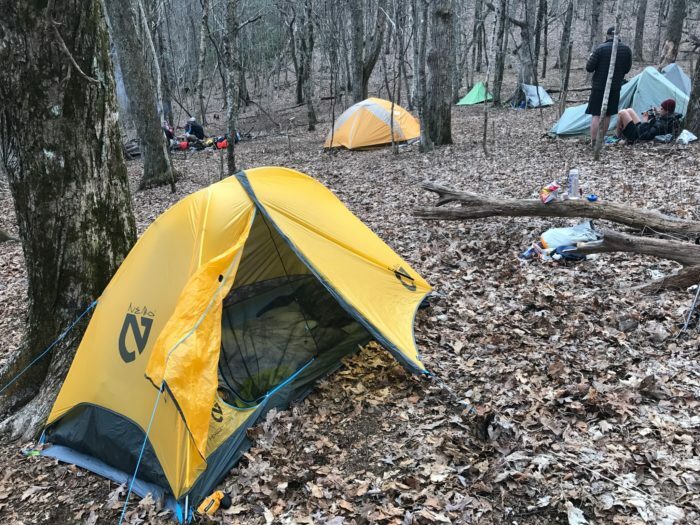 Up until now, he has patiently section hiked from Springer Mountain to Winding Stair Gap, working to finalize his pack list and resupply mileage. “After this stop, I should be good for the long haul,” he practically guffaws into the phone, his enthusiasm radiating through the speaker. Grey Beard is no stranger to endurance challenges. In 2015, he paddled the 2,345-mile Mississippi River on a mission to raise awareness for childhood diabetes. He collected piles of sponsorships, and became the subject of “Source to Sea,” a documentary following his journey. It’s apparent he has the willpower and endurance, and if thru-hiking really is a mental game, Grey Beard’s positivity and joy for life will carry him to Katahdin. What made you want to take on this record-setting thru-hike? The Appalachian Trail has been on my bucket list for years. Paddling the Mississippi at 80 showed me I could do something for the kids. It gave me a boost in life and made my spirits so high I didn’t need drugs or alcohol. Basically I needed to do this trail—I was recognized as an inspiration for generations after me, especially the two generations closest to me. I can’t tell you how many times i’ve heard from 50-60 year olds: “I want to be like you when I’m 80!” Especially at this time in America and with our heath status, it’s more important than ever for one person to prove the importance and possibilities for fitness. How do you stay healthy at over 80 years old? 1) Live happily. If you’re not happy with life and what you’re doing, everything starts attacking you, especially at an older age. This is all individual though. I couldn’t tell any one person how to be happy. There are so many formulas, you have to come up with your own. 2) I believe you can’t be sincerely happy without faith. There are many faiths that give people the same satisfaction that I get as a Christian, and that’s so important. 3) I stay active! It’s pretty simple. If you become a couch potato, you will not stay healthy. You still might get sick, but you can maximize your chances of staying healthy. And I mean active by being outside, not in a gym. Train by doing what you enjoy. Outside. When did you begin your thru-hike attempt? I officially started on January 1. I would go hike a little and come back, hike a little more, and come back. I used those miles from Springer to Franklin as shakedown hikes to get myself and my gear ready. I’m at my last stop now, to do a last check with the heart doctor and figure out the last of my gear issues. I’m heading back out on Sunday and should be able to stay out. My goal was to get 100 miles before April 1, and I got that easily. How long do you think it will take you to finish? My goal is to finish within a calendar year, my hope is to go NOBO… but fingers crossed I’m not going to be hiking on December 31. I am hoping to finish the first week in October, or within that time frame. It will probably end up being a flip-flop, but I will make that decision as I go, depending on how long it takes me to get to certain places. Have you met neat people? The people have been fantastic! I was afraid I wouldn’t be accepted into the AT culture, but it’s actually the opposite. I am accepted quite well and treated with respect. I’ve been handing out my decals, and hikers are putting them on water bottles and hiking poles, which gives me a way to open conversations. It’s really been an incredible experience. 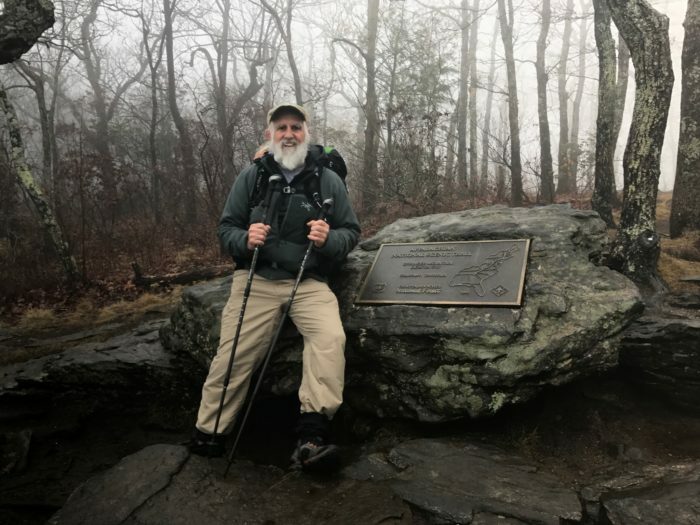 Setting the record for oldest AT thru-hiker is quite a feat, huh? Well, I haven’t done it yet! But yes, if I make it all the way through, I will be the oldest AT thru-hiker. I have plenty of people following along on my journey, and I use a SPOT tracker to share my locations as I go. The GPS will also give me a complete record so I can submit it to whomever when I get done with the trail. What do you perceive will be the biggest challenges physically and mentally? The biggest mental challenge will be staying away from the family. Physically? Getting over the mountains without having a heart attack! I’m heading to the doctor to make sure I don’t have any blockages, but man my heart gets beating so fast on climbs. On the Mississippi, I could just stop paddling if I got tired and I’d still go down the river. If I stop walking on the AT? I don’t move! Are you carrying anything different than younger hikers? Yeah… a lot of medicines. I take Lipitor, vitamins, and a blood pressure tablet, and I have a Prevacid for stomach acid. Usually by the end of my adventures I’m off of all of my medicines though… I just get to the point where I don’t need them any more. How many miles per day do you hope to average? My goal is 15 miles per day. If I drop under 12 per day, I’ll be unhappy. Health wise, I don’t think I need to go over 17-18 per day, so averaging 15 is a good target, hiking six days a week. What are the main components of your gear set up? My pack is an Osprey Exos 58, and I have a Nemo Hornet Elite tent. For my sleep system, I use a Sea to Summit sleeping pad with the Siren Down Quilt from Nemo. I’m sponsored by SteriPEN, so I carry the SteriPEN for water purification, and I am sponsored by both Jetboil and Solo Stoves. I use the lighter wood-burning Solo Stove when legal and I need to go extremely lightweight. Otherwise I use the Jetboil MicroMo. For footwear, I have high-top Vasque hiking boots. What’s your food strategy? On-trail resupply, mail drop, or a combination? I have a food sponsor, Harmony House, who mails food to me along the way. Eventually I’d like to shuttle my van up the trail and keep a lot of food in that. 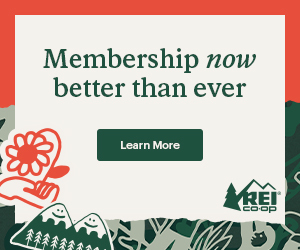 What have you noticed about the thru-hiking age demographic on the AT? I’ve hiked many different sections over the past several years, and no question about it, the hikers are getting older. There are far more 50-year-plus hikers than there were 8-10 years ago. The AT has become more well known over the past 10 years, and maybe that’s pulled some of those retirees out of the woodwork. There are still the younger ones making up the majority of thru-hikers though, 20’s seems to be the primary hiking age. Any words of inspiration for the other hikers out there, of any age? Keep your chin up and don’t get discouraged! Just put one foot in front of the other and keep hiking. Chin up, spirits up. Check out Grey Beard’s previous exploits on greybeardadventurer.com and follow his AT journey on Facebook. Great life attitude! Life is for living, not for waiting to die. You don’t chose your life, you live it! Hea thanks for blogging. Enjoy reading on you thru hikers. I’ll get there one day but until then. I’ll live the Trail life thru others. Enjoy the Trail and keep up with the great adventure. We’re rooting for you in Canada ?? I would luv to do the pct next year. Doing research and training for now.Any advice on this is much appreciated. topic for ages and yours is thee bestt I һave discovcered till now. you positiνe aboսt the supply? Go for it ! Hope to see ya out there! I arrived at Antlers camp to do Trail clearing with other MATC volunteers and Met Dale taking a rest. He was in good spirits and except for not hearing much, because he didn’t have his HA in, he as in top form. He is now SOBO flip flopped. I had seen an article about him in the BDN (Bangor Maine Daily Newspaper) earlier in the week. Grey Beard, It was very nice meeting you. Hope you have clear trails SOBO to home.